In this fourth volume of the Scots-Irish series, I scoured the archives of the Public Record Office of Northern Ireland and the Linenhall Library in Belfast to source and record in one convenient volume all available muster, militia, volunteer and yeomanry lists for county Londonderry in the period 1622-1852. 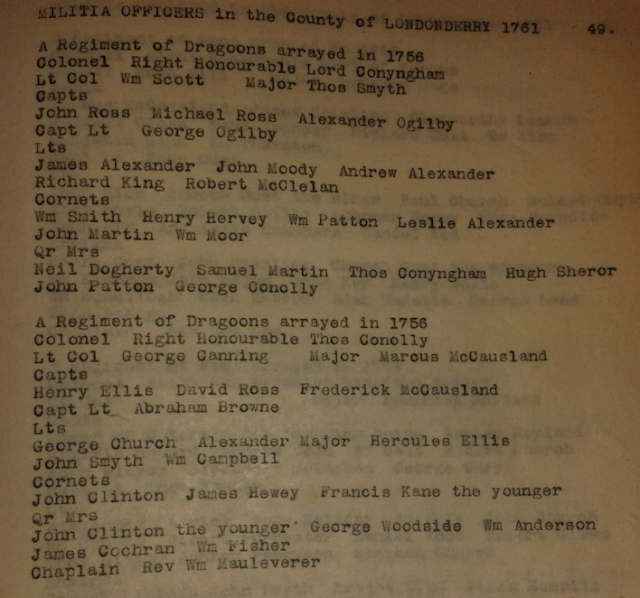 This volume also records all extant militia lists for Co Londonderry in the eighteenth century. In addition, I also trace the history and development of the Volunteer movement in the county from the 1770's and also the Yeomanry movement from its establishment in 1796 and yhis volume records for posterity all available volunteer and yeomanry lists for the county. Almost all of the military rolls recorded in this volume were listed by place either under an estate or a landlord therefore making it possible to identify the area of county Londonderry where these men were drawn from. Place is key to unlocking family history and origins in Scots-Irish genealogy. This volume makes available for the first time all of the extant muster, militia, volunteer and yeomanry lists for the county in one complete volume in fully searchable PDF format.